See more objects with the tag interior decoration, timekeeping, decorative, clock, porcelain. See more objects with the color darkgrey peru grey dimgrey darkolivegreen or see all the colors for this object. This is a Clock. It was manufactured by Meissen Porcelain Factory. It is dated 1730–32 and we acquired it in 1955. Its medium is glazed porcelain, overglaze painting and gilding, metal, glass. It is a part of the Product Design and Decorative Arts department. The lantern shape of this clock is reminiscent of the structure of traditional oriental temples and houses, reference to China popular in porcelain decoration at the Meissen factory at this time. It reflected the Chinese origins of hard-paste porcelain which Meissen had been among the first to re-discover in Europe. 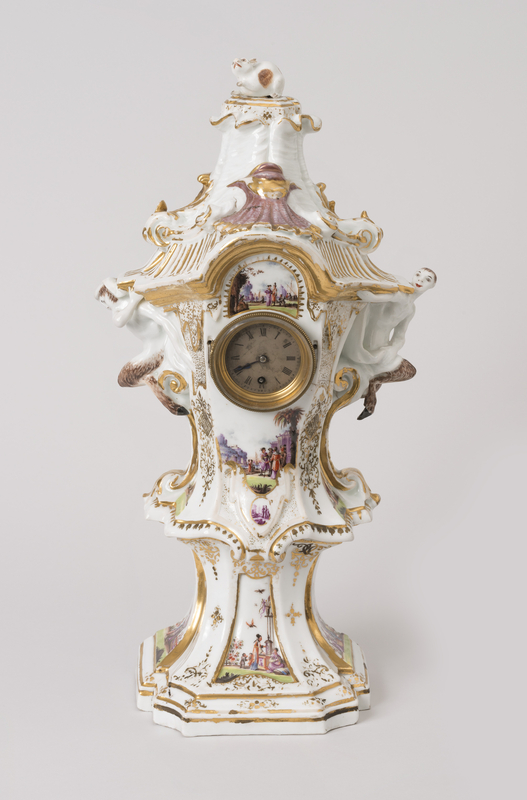 The influence is also highlighted with the gilded scrollwork and chinoiserie scenes around the base and on the face of the clock, where European versions of traditionally dressed characters can be seen. It is credited Gift of Irwin Untermyer. 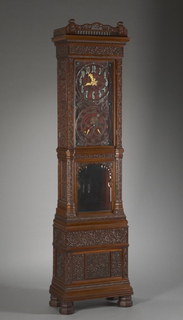 mahogany, carved teak with dial faces of gilded and patinated metal, glass. Cleveland Museum of Art, The Severance and Greta Millikin Purchase Fund,1992.70. Two swords in underglaze blue on flat back.